When you think of tweed suits and jackets, you likely think of Scotland. Why is that? Well, the river Tweed flows through Scotland and many people believe the material was originally made in the Tweed Valley. Actually, the people in that valley imported their tweed from the islands of the outer Scottish Hebrides. In those harsh cold islands, they wove the Clo Mor or Big Cloth to keep warm. Incredibly, the descriptive word “twill” was misspelled when the cloth was shipped on down to London. In London, they read the word as Tweed, assuming it came from that valley and the name stuck until now. 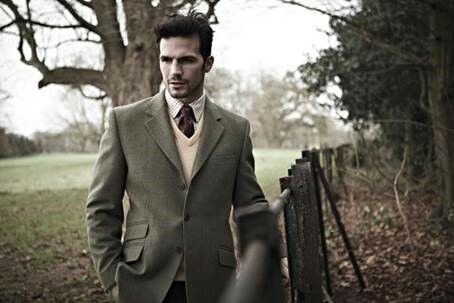 No matter, today tweed fabrics remain an excellent option for your bespoke suits or jackets. Tweed comes in quite a variety of colors and thicknesses. 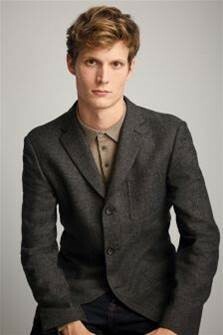 For today’s many business casual events, a tweed jacket made-to-order will fit the bill perfectly. When you combine a tweed blazer with a sweater, you are ready for anything from a cloud burst to an early winter breeze while you look like the Lord of the Manor. Some men and women will choose to make the jacket a bit sportier and hope for more of a hunting jacket look in a way. Pocket flaps with buttons are an excellent way to build in utility and style at the same time. Modern tweed fabrics have become quite fine and unlike the Big Cloth of the original wool tweed from the Hebrides, today we have excellent tweed material from which to make complete tweed suits that make welcome additions to your wardrobe. If you live in a climate that enjoys all the seasons, you might come to think of a tweed suit as essential. Here we see a fine gray tweed suit. 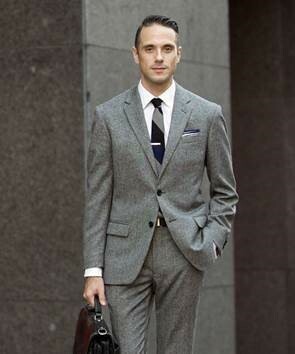 This fine suit would look good in any office and will look good for years and years of wear. Tweed comes in such a variety of colors and styles today, that you can really make it your own fashion. Add a vest pocket outside or inside. Add an extra small pocket on one side above the normal pockets. Add a vest and you might have a special waistcoat of another material made to work with the suit as well. Putting leather or metal buttons on the jacket will let it double as a blazer as well as a suit coat.